Here's some advice about photographing the Pacific Coast Highway, and some of our favorite photos as inspiration for your own trip. On our various journeys up and down the Pacific Coast Highway, Donna has taken literally thousands of photographs. She's a keen photographer and the west coast is so inspiring, with its scenery and its wildlife, and photogenic hotels and restaurants too. Round each corner is another view, so we stop the car again... and again! 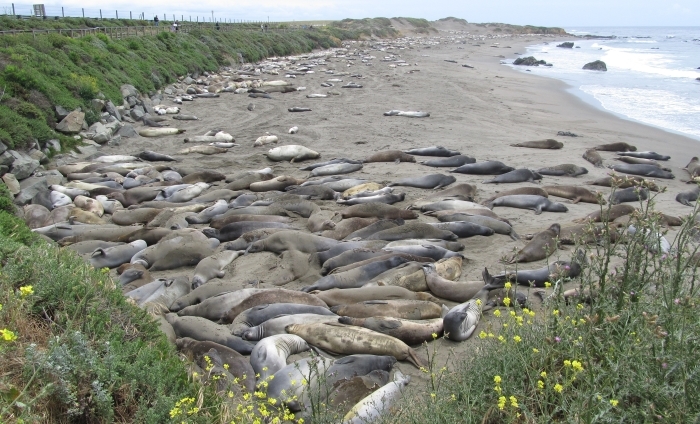 Even at places we've been to several times, such as Hearst Castle, say, or the nearby elephant seal beach at Piedras Blancas, then we get new photos to keep up-to-date, or because the weather's better, or we see something we haven't seen before. The Pacific Coast Highway is a great place for taking pictures, so when you're packing be sure to have plenty of memory cards, or plenty of capacity on your smartphone, or a means of backing up regularly. Don't forget your charging cables and plugs, and maybe a portable power supply. There's lots of inexpensive stuff around that can help you avoid those frustrations. After a recent disaster when my smartphone decided to delete some photos I'd taken a few days earlier – and had looked at on the camera and was pleased with – we invested in a phone/USB device that allows us to download photos each evening. When I Googled around to see if I could recover them, I discovered this is not an uncommon problem with smartphones. On one of our trips we forgot to pack a particular charger for a camera, so we had to drive across town to try to find a replacement. Luckily it was a town big enough to have a decent electronics store, but there are plenty of stretches of the Pacific Coast Highway where you won't find anything like that, so make a check-list before you go, or take spares with you. Many of our photos naturally get used on this website, but there isn't room to show all of them. Sometimes we don't write about a particular place, or we simply have too many photos to be able to use them all. Sometimes photos don't fit in with the words, or Donna takes a scenic shot and we look at it a few weeks later and think: now where the hell was that? We've all done that, right? 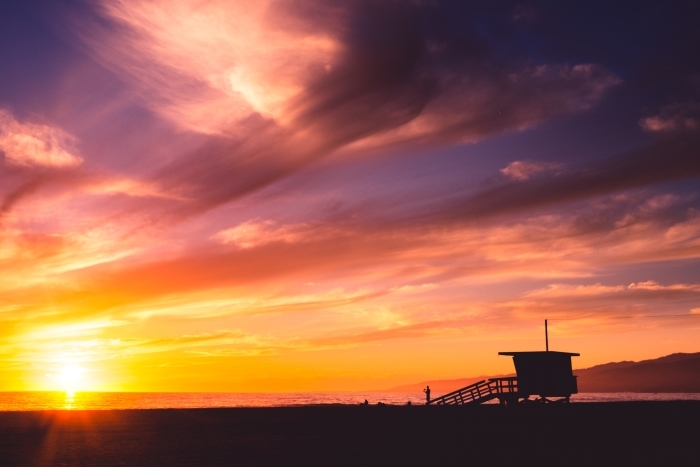 So we decided to showcase a few of our favorite photos, to inspire you for your own PCH drive. 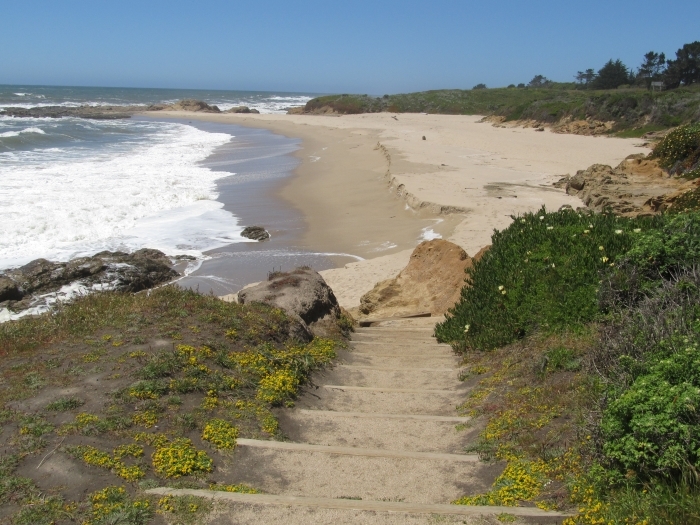 This is a beach near the Seal Cove Inn in Moss Beach near Half Moon Bay. We arrived late afternoon and went for a stroll around the hotel. Just a few minutes away these stairs tempted us down to the beach. 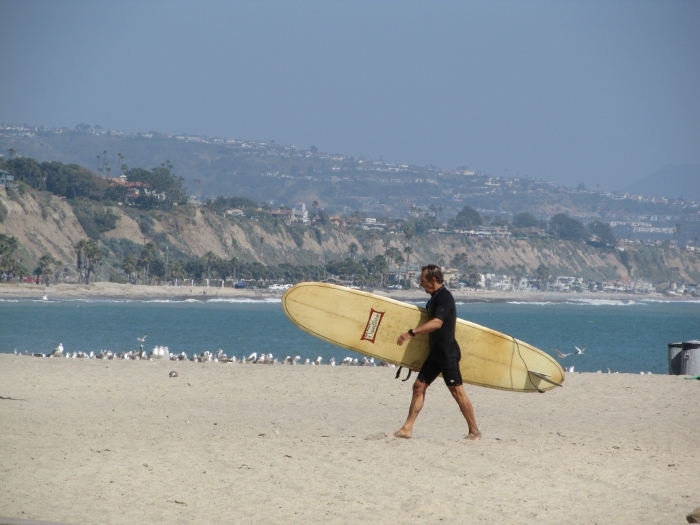 We like pictures that show the California lifestyle, like the surfers you see on lots of beaches. This guy was at Dana Point. I shudder to think how many photos we've both taken of the elephant seals at Piedras Blancas Beach, just north of Hearst Castle. We cannot pass that beach without stopping, even if we're running late, and we always stay longer than planned! It's just hard to tear ourselves away from these amazing creatures, and hard to stop taking photos of them. We take loads of photos of signs on our travels. 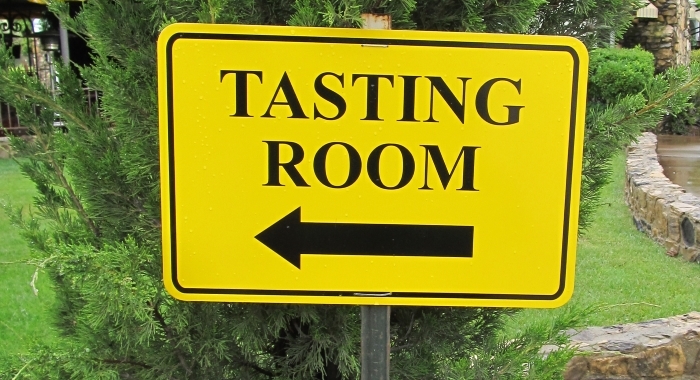 Sometimes it's an easy way to remember the exact name of a place, sometimes we use them here on the website – and we especially like signs like this one, pointing the way to our wine tasting at the JUST Inn. Wine bottles and vineyards can be very photogenic, and you can often see patterns in both the wine cellars where bottles are stacked, and outside in the perfection of the rows of vines. These bottles were at the Just Inn winery, where we stayed and did a tour of the vineyard. 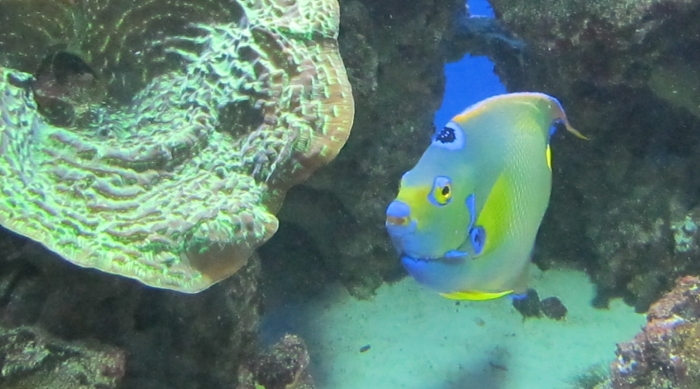 The PCH has some great aquariums, including the Monterey Bay Aquarium, which features on our list of top PCH attractions. This photo, though, was taken in the aquarium in La Jolla and shows what lovely photos you can get, even when shooting through glass. The trick is to get up real close, so the camera doesn't focus on the glass, and to make sure you have no reflections. There's lots of marine wildlife to photograph, although a whale-watching cruise can be a real challenge. There are birds, too, from pelicans to eagles. But don't ignore the everyday critters you see everywhere, like ground squirrels. They're not as nervous, and you can get quite close. 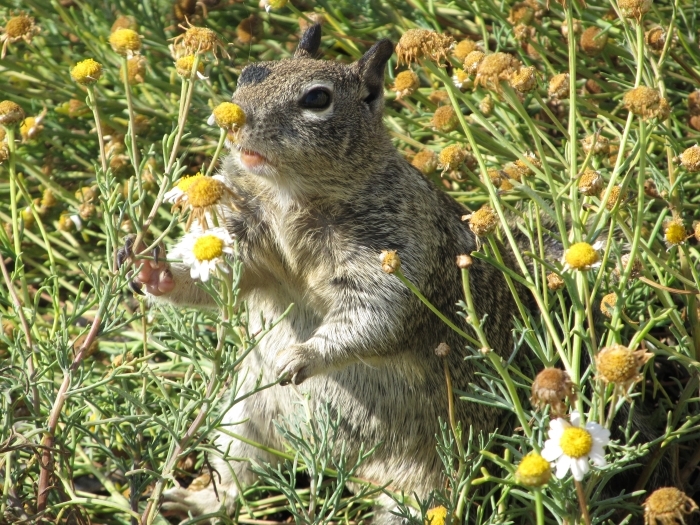 This little guy in La Jolla was having a great time tucking into flowerheads. Here he's sniffing one first. Donna got some really cute pictures of him holding the stalks in his little paws. 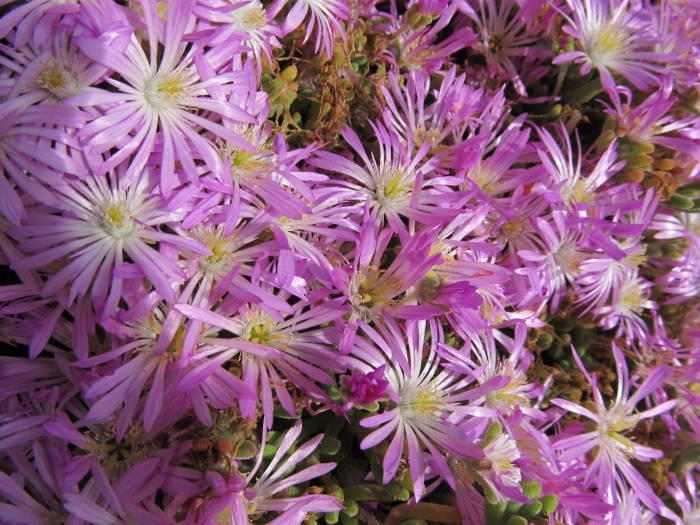 Spring is a good time for driving PCH as there are flowers out in abundance, like these in La Jolla. We're not very good st identifying them but we do like photographing them – especially when you get in close and can see the detail and create a photo with a mass of color. 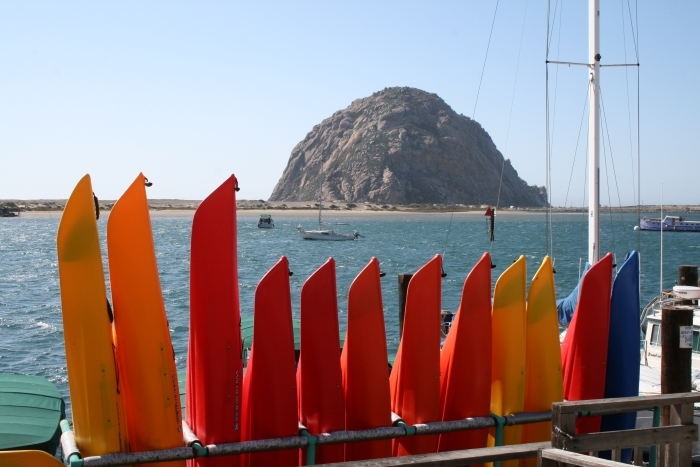 We all went memories of the places we visit and as we love Morro Bay we have LOTS of photos of it. It's an excellent place for wildlife, and we always see sea otters there, and falcons on the Morro Bay Rock that you can see in the distance on this photo. Donna took this one down in the harbor, though, attracted by the colorful kayaks. We almost used it on the cover of our PCH Hotels guide one year – and maybe we still will!